Sarit Michaeli, of the human rights group B’Tselem, was hit by a rubber bullet shot at close range during weekly Nabi Saleh protest. Sarit Michaeli, the spokeswoman of human rights group B’Tselem, was lightly injured during a Friday demonstration at Nabi Saleh after a Border Policeman shot her with a rubber bullet at close range. Michaeli was videotaping the protest being held at the village of Nabi Saleh, near Ramallah- an event held every Friday, which is routinely dispersed by IDF forces. 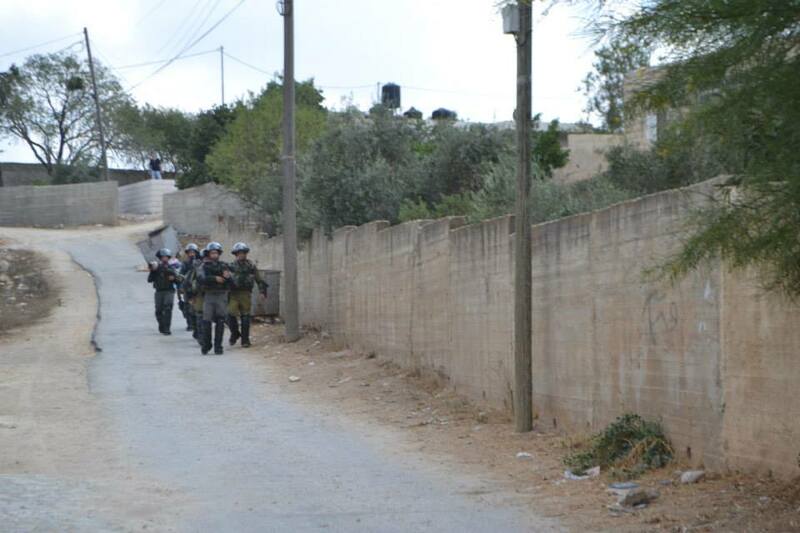 This week, Border Police troops belonging to the Binyamin regional command were policing the area. “I was on the village’s main road,” said Michaeli, speaking to Haaretz. “A few youths were throwing stones. Some nine policemen and soldiers stormed the group, causing them to run away. I was standing to the side. At a certain point, one of the policemen fired a rubber bullet at me, at a range of about 15 or 20 meters. I do not know why he shot at me. I was not doing anything that could be perceived as a threat to any of the soldiers. Also, I was not in the route of the soldiers’ advance, so they had to have intentionally aimed at me or the two women standing beside me.” The bullet pierced Michaeli’s thigh, and she was evacuated to Ichilov hospital, where she is still hospitalized. From Michaeli’s description of the events, it appears the policemen were not acting in accordance with regulation on opening fire. According to the IDF’s rules of engagement, rubber bullets are only to be used from a range of 50 meters or more, a distance at which the projectiles are meant to hit skin without penetrating it. The fact that the bullet pierced Michaeli’s thigh indicated it was shot at close range. In addition, such ammunition is not to be used during a forces’ advance- rather, being a precise weapon, aimed at specific targets pre-approved by senior officers. The IDF Spokesman’s Office declined to comment on the matter, choosing to refer Haaretz’s inquiry to the Border Police Spokesman, who too declined to comment. 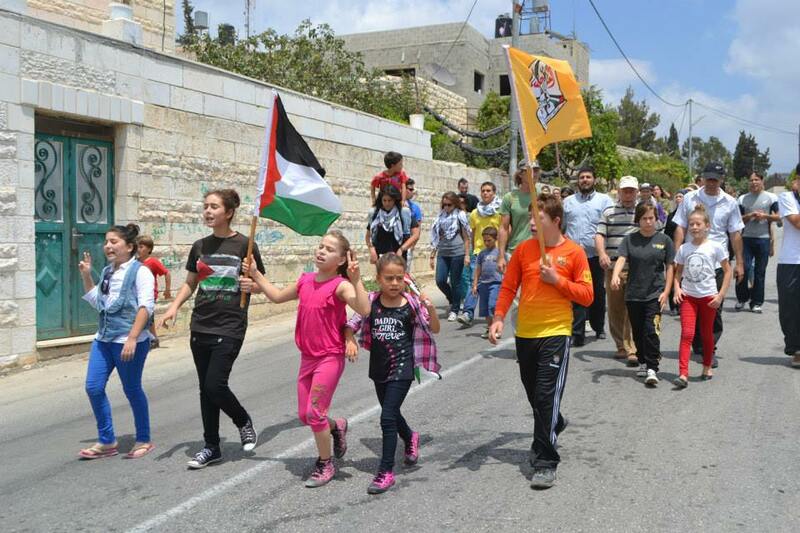 Today, around fifty Palestinians together with Israeli and international activists marched from the centre of Nabi Saleh down the main road towards the stolen spring. 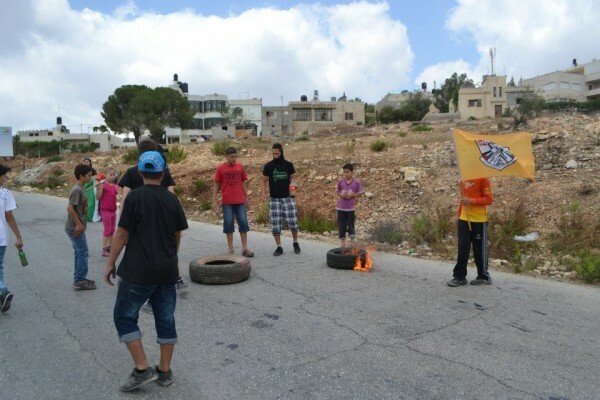 Protesters made barricades of burning tyres to prevent Israeli forces from raiding the village. 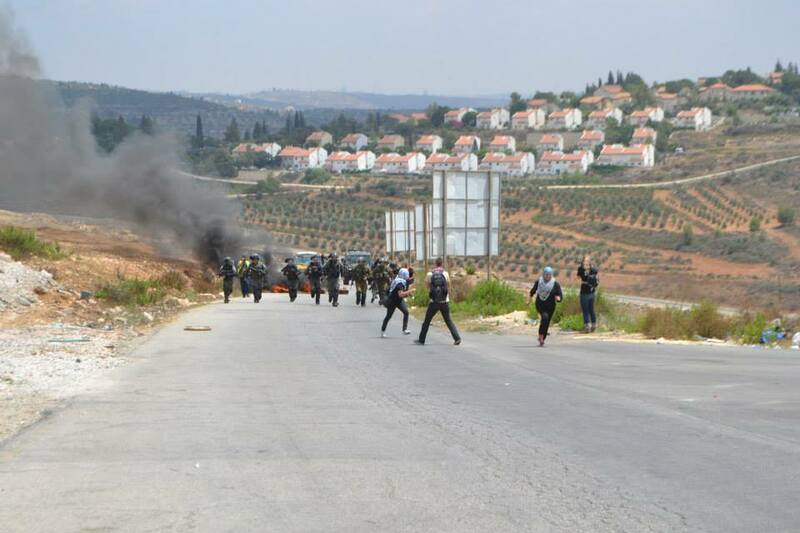 Soon after that, several Israeli border police officers appeared behind a house on the right side of the main road and started shooting rubber coated steel bullets at protesters. More Israeli border police then arrived at the bottom of the main road, running towards protesters and shooting more rubber coated steel bullets. 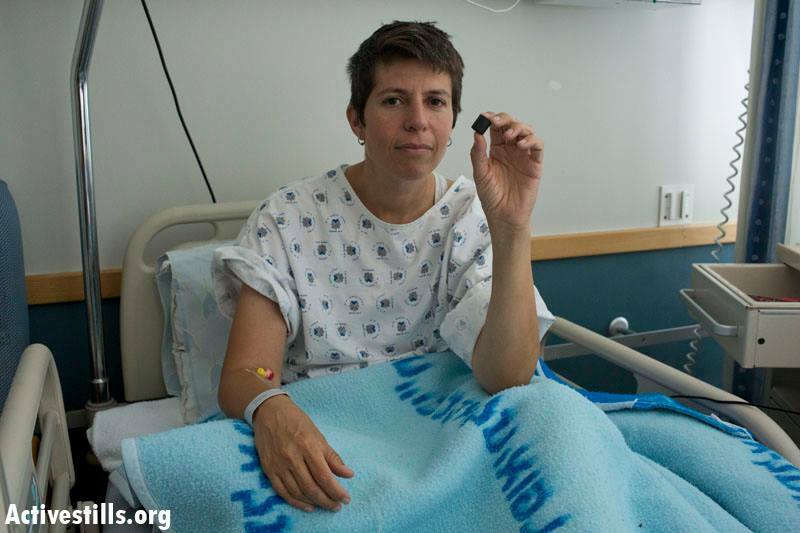 An Israeli woman activist was shot in her upper thigh with a rubber coated steel bullet from close range and had to be taken to hospital in Tel Aviv. She underwent a very minor surgery to get the bullet removed and will remain in hospital until Sunday. Israeli forces continued shooting rubber coated steel bullets and tear gas canisters from various locations inside the village. According to a resident of Nabi Saleh, yesterday night at around 3am, an Israeli bulldozer was working in the spring. Settlers from Halamish also went to the spring to talk to the soldiers. 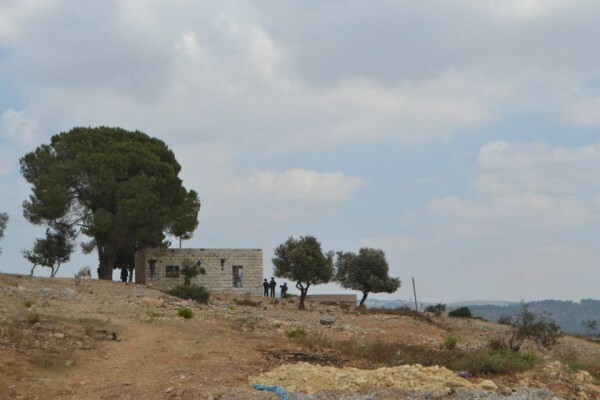 Palestinian youths went to the hilltop in front of this area to see what was happening and verbal confrontations between settlers and them erupted. Israeli forces, defending the settlers as usual, shot several tear gas canisters at Palestinians. Previously this week, on Tuesday, clashes between residents of Nabi Saleh and Israeli forces erupted in the same spot where Rushdi Tamimi was shot last November. Israeli forces shot rubber coated steel bullets and injured Mohammed Tamimi (10) in the leg. Mahmoud Tamimi (22) was then shot with live ammunition also in the leg. Read the full report here. On Friday, 9 December 2011, the weekly demonstration was held in the village of a-Nabi Saleh, Ramallah District, against settlers’ seizure of land belonging to Palestinian villages in the area. According to B’Tselem’s information, in the early afternoon, after the main demonstration had dispersed, several young men threw stones at an army jeep. One of them was village resident Mustafa a-Tamimi. Photos taken by photographer Haim Scwarczenberg show that the jeep turned around and began to back away. A soldier sitting in the jeep then opened the back door and fired a tear-gas canister directly at a-Tamimi, who was several meters away. The canister struck Tamimi in the face, causing extensive bleeding. Shortly afterwards, the soldiers evacuated him to Beilinson Hospital, where he died the next day. B’Tselem has documented many cases in which tear-gas canisters were fired directly at people during the weekly protest in a-Nabi Saleh, including other occasions during the same demonstration, and elsewhere in the West Bank. 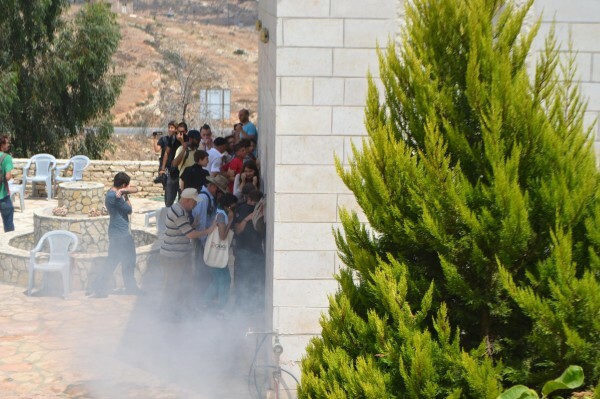 For several years now, B’Tselem has been warning officials that security forces’ fire tear-gas canisters directly at persons during demonstrations. The organization has demanded – both in meetings with senior military officials and by letter – that commanders clarify to soldiers serving in the field that firing tear-gas canisters directly at a person is unlawful. Tear gas is supposed to serve as a non-lethal crowd control measure, and using it as a substitute for live fire is forbidden. Therefore, firing tear-gas canisters directly at persons breaches the rules of engagement. Such firing has resulted in serious injury and death. In April 2009, Bassem Abu-Rahmah, from the village of Bi’lin, was killed by a tear gas canister that struck him in the chest. B’Tselem knows of 13 cases in which persons were seriously injured in similar circumstances since the beginning of the second intifada. B’Tselem has also documented direct firing of canisters that did not result in injury, and has provided the Military Advocate General Corps and the commander of Judea and Samaria Brigade with video footage of such firing. The moment of firing at a-Tamimi. The 40mm launcher end can be seen emerging from the opened jeep door. The tear gas canister itself is seen against the backdrop of the left mirror. On the left, in the white shirt, is Mustafa a-Tamimi. Photo: Haim Scwarczenberg. In response to B’Tselem’s demands, the then-legal advisor for Judea and Samaria, Col. Sharon Afek, replied in April 2009 that, “direct firing [of tear-gas canisters] at persons is prohibited” and that, “very soon, an explicit and broad directive will be issued that will prohibit the firing of a tear-gas canister directly at a person.” In July 2011, following further requests by B’Tselem, after the direct firing continued to occur at demonstrations, Major Uri Sagi, of the office of the legal advisor for Judea and Samaria, replied that, “following your letter, we have again clarified to the forces operating in Central Command the rules relating to firing of tear-gas canisters at persons, including the prohibition on directly firing a tear-gas canister at a person.” At meetings with B’Tselem, senior military officials claimed that such firing is forbidden and does not occur. However, B’Tselem has since documented more cases in which security forces fired tear-gas canisters directly at persons. As far as B’Tselem knows, no soldier has been prosecuted for such firing. In the abovementioned case of Abu-Rahmah, which occurred in April 2009, a Military Police investigation was opened only in July 2010, and only after B’Tselem and Attorney Micha’el Sfard threatened to petition the High Court of Justice if an investigation were not initiated. B’Tselem wrote to the office of the military advocate for operational matters to verify that an MPIU investigation had been opened in the case of a-Tamimi, in accordance with the new policy that the MAG Corps declared before the High Court of Justice. B’Tselem demanded that the investigation examine not only the conduct of the soldier who fired the canister, but also the responsibility of the command echelon, including the orders given to the soldier. B’Tselem will provide all the material in its possession and will follow the case to make sure the investigation is effective and professional. Following their 12-9-2011 report documenting how Occupation Forces denied residents of Nabi Saleh their right to protest and the excessive force used to suppress the protests that did occur, B’Tselem: the Israeli Information Center for Human Rights in the Occupied Territories detailed their findings in the report at a press conference in Nabi Saleh to members of the media. The Association for Civil Rights in Israel (ACRI) addressed the Kafkaesque rules governing the permitting and policing of protests in the West Bank and prior to the presentations, two Nabi Saleh villagers; Abu Hossam Tamimi and Bashir Tamimi discussed popular resistance to the occupation in Nabi Saleh and throughout the West Bank.